DAYTONA, Florida – January 26, 2009 – After leading the race, and with a top-5 finish in sight after 18 hours of almost trouble-free racing in the 47th Annual Rolex 24, the #77 Doran Racing / McDonald’s Doran-Dallara Ford succumbed to the same electrical ‘gremlins’ that felled six of the seven Ford-powered Daytona Prototypes in the 49-car starting field. The problem in each case was ultimately traced to the failure of a crankshaft position sensor used in each of the 500 horsepower Ford V-8 engines. 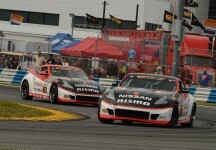 Things were looking promising for the Doran Racing/McDonald’s team in the early stages of the race. After running in the top-10 during pre-event testing earlier this month, the team experienced a mysterious handling problem in pre race practice, problems that relegated them to the 16th spot on the starting grid after Thursday’s 20-minute qualifying session. A dramatic, last-minute setup change produced a good car for the race and the team was able to run with the leaders. Jaeger is a native of Cincinnati, Ohio and recent graduate of Vanderbilt University where he was a member of their Formula SAE team. His racing resume includes karting, Sports 2000, Skip Barber, F2000, Star Mazda and the Indy Pro Series. He co-drove his first prototype race for the Doran team in the 2007 season finale at Miller Motorsport Park and was a full-time driver during the 2008 season. Joining Gidley and Jaeger in the #77 car for the Rolex 24 were Matteo Bobbi and Fabrizio Gollin, both of whom are highly-experiences endurance racing drivers and veterans with Doran Racing; the duo were the team’s full-time drivers in 2005-2006. The 47th Annual Rolex 24 also marked the first appearance of McDonald’s, the world’s leading food service retailer, as the primary sponsor of a team in the Rolex Series. 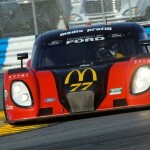 McDonald’s, along with additional companies to be announced in the coming weeks, will appear throughout the 2009 season on the #77 Doran Racing machine. During the 2008 season, Doran Racing scored a remarkable string of eleven top-10 finishes, eight of them in a row. The 2009 #77 Doran Racing/McDonald’s/Doran-Dallara Ford is a refined, updated version of the car the team campaigned so successfully in 2008. It features a Doran chassis fitted with Dallara bodywork featuring enhanced aerodynamics and increased downforce. Power is provided by a 500 horsepower Roush-Yates Ford V-8 engine. Round 2 of the 2009 Rolex Series, the Bosch Engineering 250, takes place April 24-25 at Virginia International Raceway, the challenging 3.27-mile, 17-turn road course located in Alton, VA. Doran Racing ran a 2-car team for this event in 2008 with the #47 car co-driven by Burt Frisselle and Gabriele Gardel finishing 8th. The #77 car, co-driven by Gidley and Jaeger, qualified 7th, but an off-course excursion damaged the car sufficiently to require a lengthy visit to the pits. On re-joining the race, Gidley was running lap times equal to the race leaders and soldiered on to bring the car home in 41st place. McDonald’s USA, LLC, is the leading foodservice provider in the United States serving a variety of wholesome foods made from quality ingredients to millions of customers every day. More than 80 percent of McDonald’s 14,000 U.S. restaurants are independently owned and operated by local franchisees. For more information on McDonald’s visit www.mcdonalds.com or log on at any of the 10,000 Wi-Fi enabled McDonald’s U.S. restaurants.